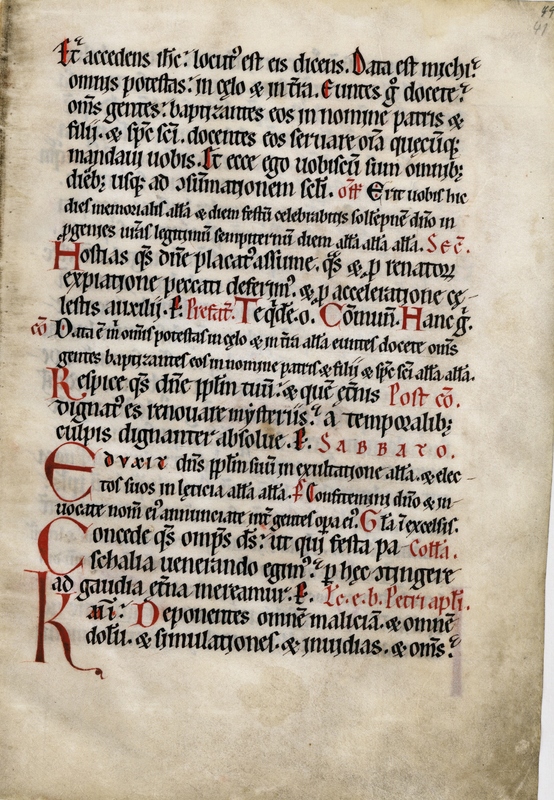 Text: This leaf contains text for the Friday and Saturday after Easter, including Matthew 28:18-20 and 1 Peter 2:1 (recto); 1 Peter 2:1-10 and John 20:1 (verso). The responses have not yet been transcribed. Et accédens Jesus locútus est eis, dicens: Data est mihi omnis potéstas in cælo et in terra: eúntes ergo docéte omnes gentes: baptizántes eos in nómine Patris, et Fílii, et Spíritus Sancti: docéntes eos serváre ómnia quæcúmque mandávi vobis: et ecce ego vobíscum sum ómnibus diébus, usque ad consummatiónem sǽculi. 18 And Jesus coming, spoke to them, saying: All power is given to me in heaven and in earth. 19 Going therefore, teach ye all nations; baptizing them in the name of the Father, and of the Son, and of the Holy Ghost. 20 Teaching them to observe all things whatsoever I have commanded you: and behold I am with you all days, even to the consummation of the world. detractiónes, sicut modo géniti infántes, rationábile, sine dolo lac concupíscite: ut in eo crescátis in salútem: si tamen gustástis quóniam dulcis est Dóminus. Ad quem accedéntes lápidem vivum, ab homínibus quidem reprobátum, a Deo autem eléctum, et honorificátum: et ipsi tamquam lápides vivi superædificámini, domus spirituális, sacerdótium sanctum, offérre spirituáles hóstias, acceptábiles Deo per Jesum Christum. 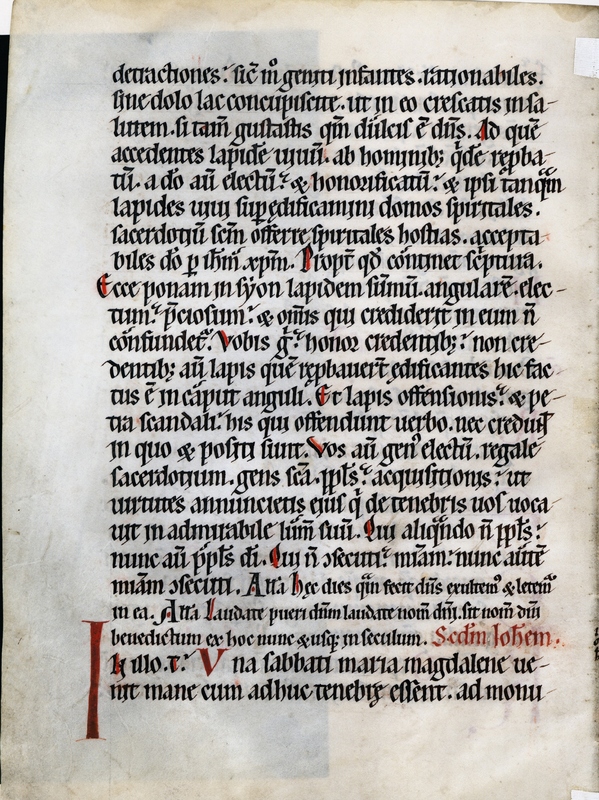 Propter quod cóntinet Scriptúra: Ecce pono in Sion lápidem summum angulárem, eléctum, pretiósum: et qui credíderit in eum, non confundétur. Vobis ígitur honor credéntibus: non credéntibus autem lapis, quem reprobavérunt ædificántes: hic factus est in caput ánguli, et lapis offensiónis, et petra scándali, his qui offéndunt verbo, nec credunt in quo et pósiti sunt. Vos autem genus eléctum, regále sacerdótium, gens sancta, pópulus acquisitiónis: ut virtútes annuntiétis ejus qui de ténebris vos vocávit in admirábile lumen suum. Qui aliquándo non pópulus, nunc autem pópulus Dei: qui non consecúti misericórdiam, nunc autem misericórdiam consecúti. ...detractions, 2 As newborn babes, desire the rational milk without guile, that thereby you may grow unto salvation: 3 If so be you have tasted that the Lord is sweet. 4 Unto whom coming, as to a living stone, rejected indeed by men, but chosen and made honourable by God: 5 Be you also as living stones built up, a spiritual house, a holy priesthood, to offer up spiritual sacrifices, acceptable to God by Jesus Christ. 6 Wherefore it is said in the scripture: Behold, I lay in Sion a chief corner stone, elect, precious. And he that shall believe in him, shall not be confounded. 7 To you therefore that believe, he is honour: but to them that believe not, the stone which the builders rejected, the same is made the head of the corner: 8 And a stone of stumbling, and a rock of scandal, to them who stumble at the word, neither do believe, whereunto also they are set. 9 But you are a chosen generation, a kingly priesthood, a holy nation, a purchased people: that you may declare his virtues, who hath called you out of darkness into his marvellous light: 10 Who in time past were not a people: but are now the people of God. Who had not obtained mercy; but now have obtained mercy.